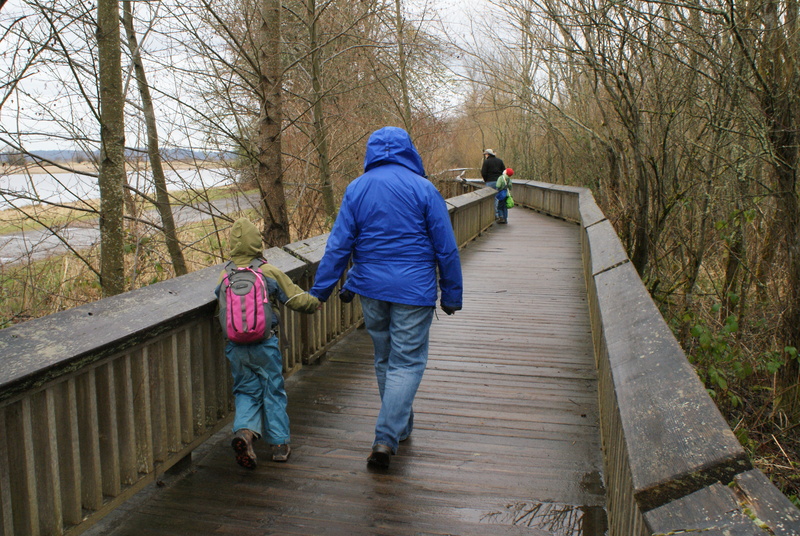 Grandma and Daddy joined us recently for a trip to the Nisqually National Wildlife Refuge. On the drive down, it was pouring rain, but when we got there the showers let up and we were mostly dry. 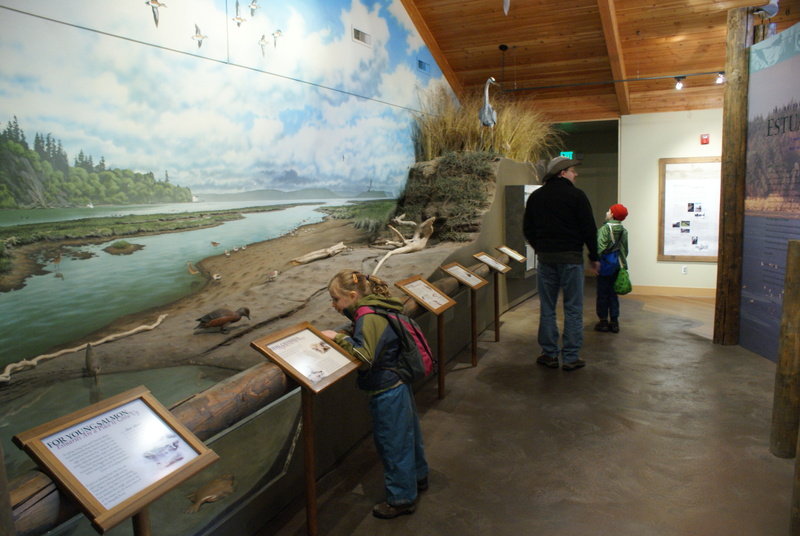 We started out looking through the Visitor Center, enjoying the displays about the estuary. 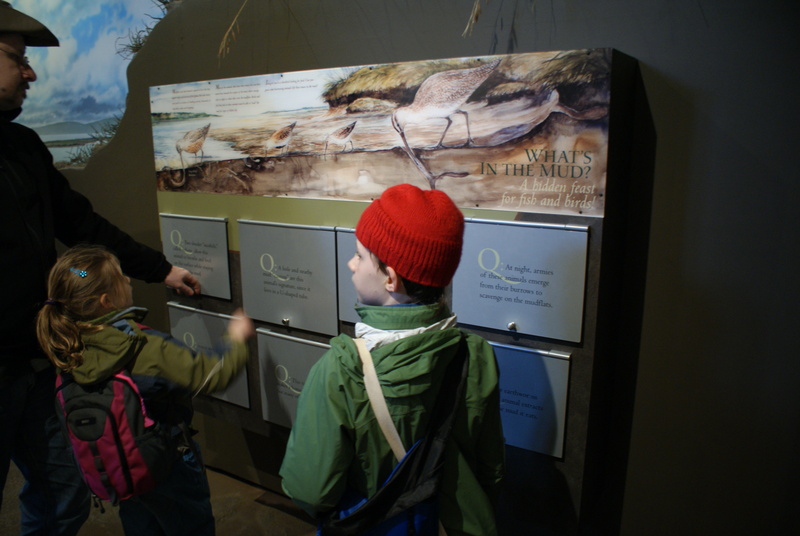 They have some models of birds, which the kids loved, and an interactive display about creatures that live in the mud. There are also maps and other interpretive information to look through. 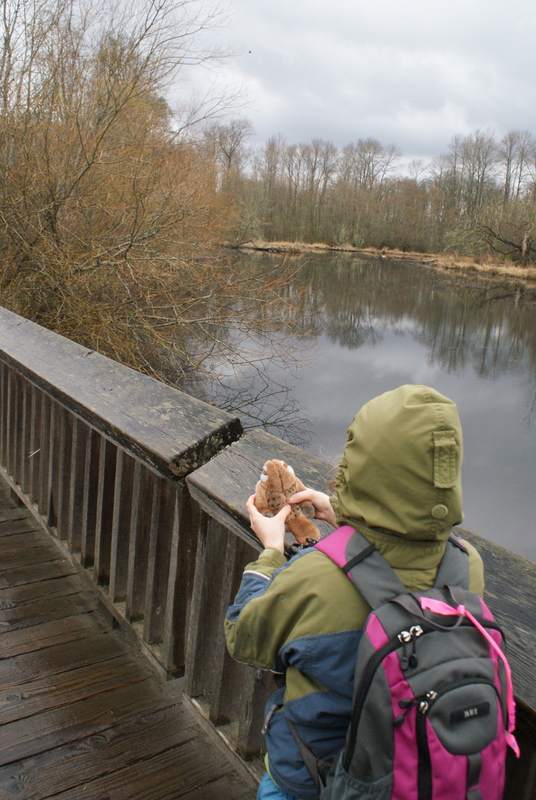 I am a softie and was persuaded to spend some of our education money in the gift shop, and then we ventured out to the trails to see what we could see. The boardwalk trail leaves from behind the Visitor Center. You will walk on wooden boardwalks through the middle of the tangled wetland. We were thrilled by the abundant bird life around us as we slowly made our way down the trail. 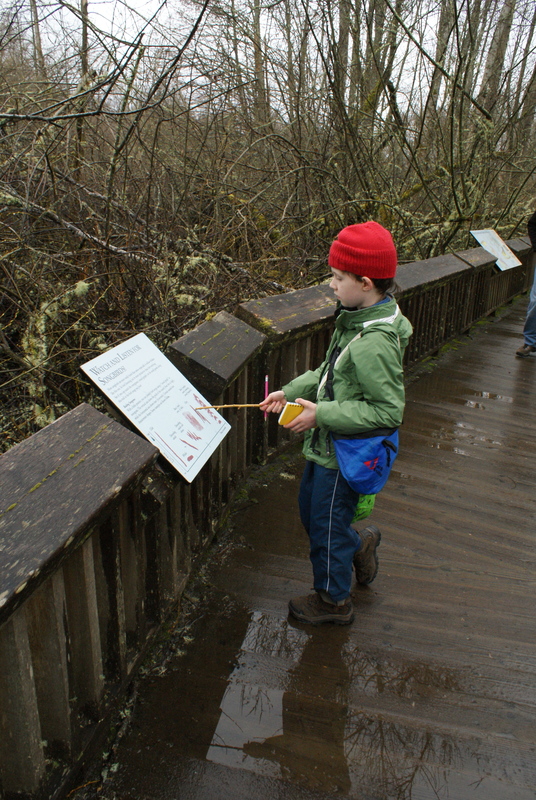 The wood wasn’t too slippery, and there were interpretive signs along the sides of the path. We saw nesting Canada geese, Eurasian Wigeons, Ring-necked ducks, hooded mergansers, and mallards. Audubon’s warblers flitted around in the trees and bushes. Annika had gotten a stuffed white-crowned sparrow in the gift shop. It made the noise of the bird when you pressed on it. She had fun talking back to the real white-crowned sparrows in the bushes as we walked along. The stuffed version sounded remarkably similar to the real thing! 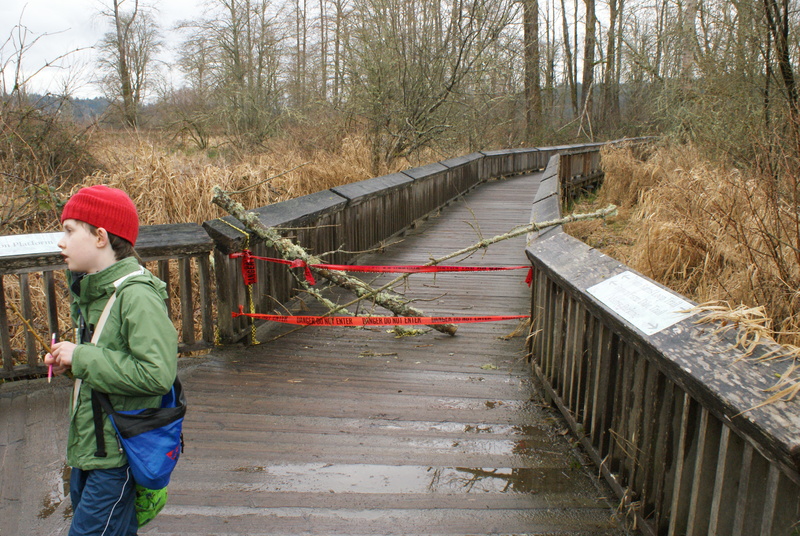 We made it to the far end of the boardwalk loop, and part of the trail was blocked off due to damage. 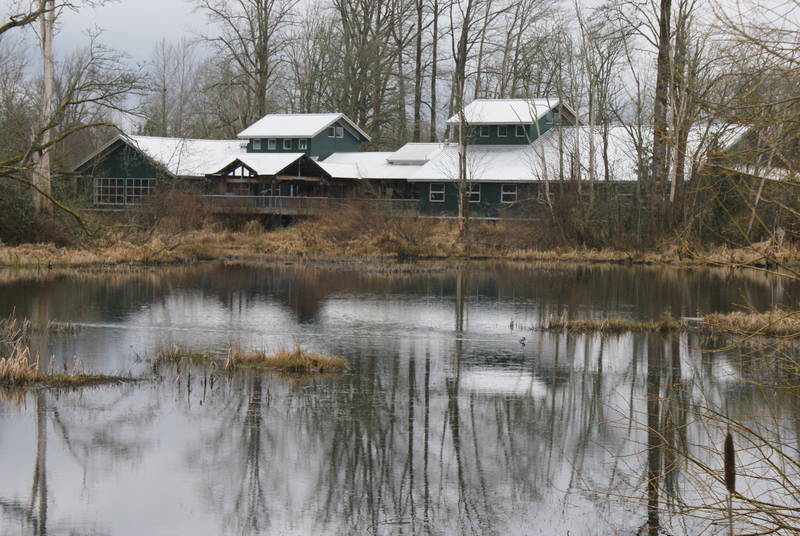 So after a brief stop at the picnic tables near the barns, we looked out over the wetlands to the west. Hummingbirds, ducks and geese were prevalent, and we even saw a bald eagle swoop down and try to catch some prey, then veer upwards and land in a tree. Swallows careened overhead as the sun briefly made an appearance. We were able to continue around on the gravel path and meet up with the rest of the boardwalk after the damaged section. We looked briefly at the muddy and swirling Nisqually River before heading back to the Visitor Center. There were beaver signs, and we watched a squirrel cross a section of open water by jumping from one tree branch to another, following its own little highway in the sky. We made it back to the parking lot as the rains started again. 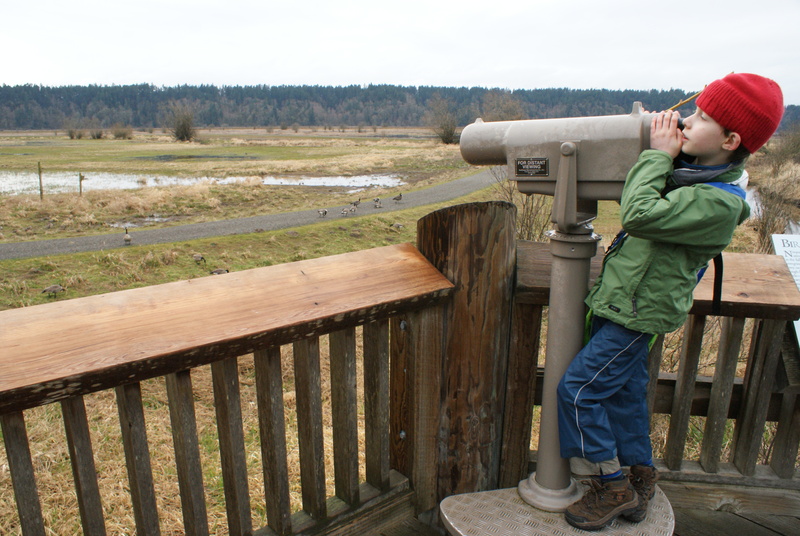 My kids found our walk inspiring, and really enjoyed watching the birds. Next time we hope to go back and walk further out into the estuary. This would be a great trip for all ages, as you have options of short and longer walks. They even have a new area (we didn’t visit it) where kids can dig in the dirt and make nature art, a kind of natural playground. We look forward to going back in the future and checking more of the park out. 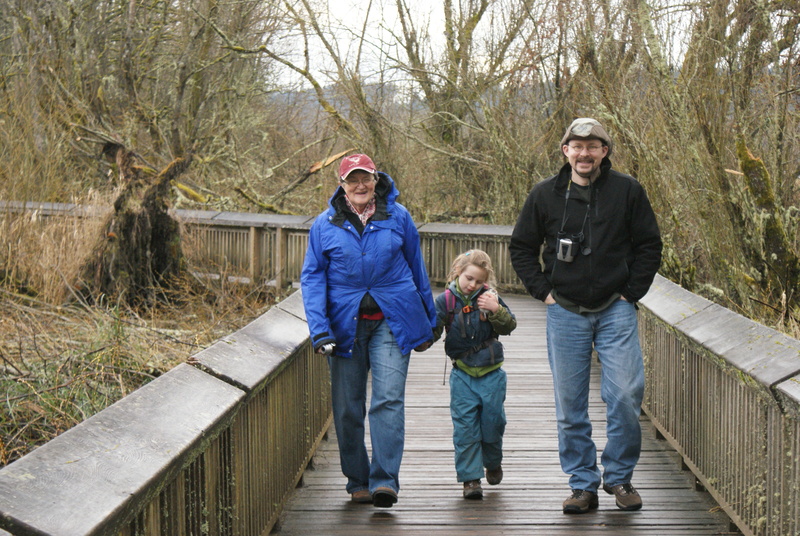 It costs $3 per family to visit the refuge.